Some of the health benefits of quince include its ability to help prevent cancer, aid in weight loss, improve digestive health, reduce cholesterol, boost immune system strength, prevent gastrointestinal diseases, soothes inflammation, increase the health of your skin, decrease blood pressure, prevent allergic reactions, and stimulate circulation in the cardiovascular system. Quince is a rather unusual fruit that is closely related to apples and pears. Its scientific name is Cydonia oblonga, and it is the only member of its genus Cydonia. The quince tree is deciduous and rather small, while the valuable ripened fruit is yellowish-gold color and somewhat similar to pears in shape and consistency. The value of the fruit as a food item dates back a long time, but the small tree is often grown for its ornamental quality as well, because of its attractive pale pink blossoms. Quince is native to the Eurasian area, including Uzbekistan, Armenia, Turkey, Hungary, Macedonia, and other nearby regions. Historically, quince may have played a much larger role than most people expect. Some researchers actually think that when “apples” were referenced in ancient history, they were more likely talking about quince, which were much more common in those areas. You can utilize quince in jams, jellies, and puddings, as well as used in a similar way to pears as a side dish or a breakfast food. Different countries use quince in different ways, often using the juice as a flavoring agent. However, the real benefit of quince is eating the skin and the fleshy fruit, since it is packed with beneficial nutrients, including vitamins, minerals, phenolic compounds, antioxidants, and dietary fiber. Cancer Prevention: It seems as though cancer is one of the most frequently discussed diseases in recent history. Therefore, anything that can reduce the chances of developing cancer usually becomes quite popular. The high level of antioxidants, including phenolic and phytonutrient compounds, found in quince is very effective in neutralizing or eliminating free radicals in the body. Free radicals are the dangerous byproducts of cellular metabolism than can cause healthy cells to mutate or die. 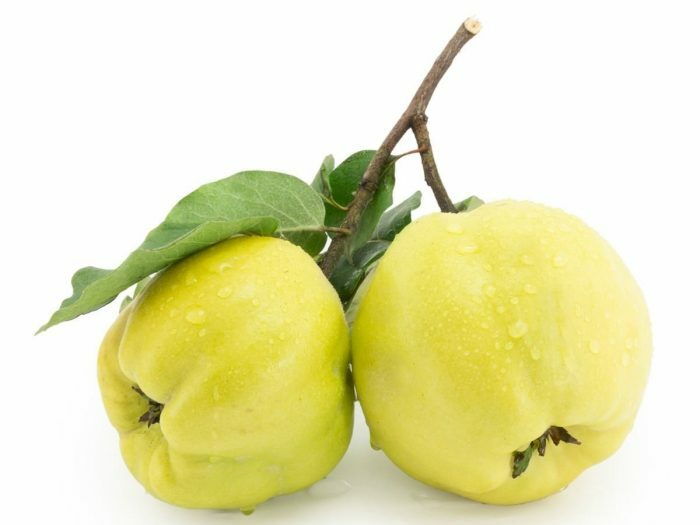 The antioxidant compounds found in quince have been directly connected to reduced chances of developing various types of cancer. Weight Loss Aid: One of the best ways to keep your weight down and guarantee a speedy metabolism that will keep your system running optimally is to improve your digestion. Quince is high in dietary fiber, as are most fruits, but the significant levels mean that your gastrointestinal system works more efficiently and regularly. You will have more energy and keep your excess waste weight down by improving your digestive health. Gastrointestinal Diseases: Beyond the general functioning of the digestive tract that dietary fiber facilitates, it can also help to prevent certain gastrointestinal conditions like Inflammatory Bowel Disease (IBD), various cancers, or diverticulitis. The catechin and epicatechin contained in the fiber will bind with certain cancer-causing toxins that are found in the colon, thereby protecting the mucus membrane of that important organ system. Skin Health: The high level of antioxidants and vitamins found in quince are very beneficial for keeping your skin looking healthy and young. Antioxidants eliminate the damage that free radicals due to skin cells,thereby reducing the appearance of wrinkles, eliminating blemishes, and helping to defend your skin against the effects of UV radiation. Blood Pressure Monitor: Potassium is one of the most important minerals in the human body, because it is essential for maintaining blood pressure and facilitating effective fluid transfer in the body’s cells. In terms of blood pressure, potassium causes the blood vessels and arteries to relax, thereby reducing the strain on the cardiovascular system. This can decrease the chances of developing conditions like atherosclerosis, which can lower your risk for coronary heart diseases, heart attacks, and strokes. Allergic Reactions: Quince has long been praised for its ability to control allergic reactions. When applied as a salve or gel on the skin, it can benefit atopic dermatitis and other similar skin conditions. The high levels of vitamin C also help to control inflammation and improve the health and appearance of your skin. Immune System Booster: As mentioned earlier, quince has a huge amount of antioxidants, but the other vitamins, such as vitamin C and E, also boost the immune system in various ways. For example, vitamin C stimulates the immune system to increase the supply of white blood cells, which are the first line of defense against pathogens, viruses, and bacteria in the body. Circulation and Hair Health: The rich mineral content of quince includes iron, copper, and zinc. These three minerals, along with various other trace elements, are necessary for the production of red blood cells. When red blood cell production is high, then circulation around the body increases, which means that oxygen is carried throughout the body. This causes increased blood flow to the skin and scalp, which can increase hair follicle health and stimulate growth. A Final Word of Caution: There is not definitive evidence of side effects of risks of quince and all of the information seems to point towards quince being a great addition to any diet. However, quince seeds do contain trace amounts of cyanide, so eating more than a few seeds could be troublesome. Additional scientific studies are ongoing that are exploring the pros and cons of this delicious fruit.